"Wherever you find yourself, do not go forth from that place too quickly. Try to be patient and learn to stay in one place." Saint Anthony the Great is known as the Father of monasticism, and the long ascetical sermon in The Life of Saint Anthony by Saint Athanasius (Sections 16-34), could be called the first monastic Rule. When Saint Anthony was about twenty years old, he lost his parents, but he was responsible for the care of his younger sister. Going to church about six months later, the youth reflected on how the faithful,in the Acts of the Apostles (4:35), sold their possessions and gave the proceeds to the Apostles for the needy. Leaving his parental home, Saint Anthony began his ascetical life in a hut not far from his village. By working with his hands, he was able to earn his livelihood and also alms for the poor. Sometimes, the holy youth also visited other ascetics living in the area, and from each he sought direction and benefit. He turned to one particular ascetic for guidance in the spiritual life. In this period of his life Saint Anthony endured terrible temptations from the devil. The Enemy of the race of man troubled the young ascetic with thoughts of his former life, doubts about his chosen path, concern for his sister, and he tempted Anthony with lewd thoughts and carnal feelings. But the saint extinguished that fire by meditating on Christ and by thinking of eternal punishment, thereby overcoming the devil. Realizing that the devil would undoubtedly attack him in another manner, Saint Anthony prayed and intensified his efforts. Anthony prayed that the Lord would show him the path of salvation. And he was granted a vision. The ascetic beheld a man, who by turns alternately finished a prayer, and then began to work. This was an angel, which the Lord had sent to instruct His chosen one. Saint Anthony tried to accustom himself to a stricter way of life. He partook of food only after sunset, he spent all night praying until dawn. Soon he slept only every third day. But the devil would not cease his tricks, and trying to scare the monk, he appeared under the guise of monstrous phantoms. The saint however protected himself with the Life-Creating Cross. Finally the Enemy appeared to him in the guise of a frightful looking black child, and hypocritically declaring himself beaten, he thought he could tempt the saint into vanity and pride. The saint, however, vanquished the Enemy with prayer. For even greater solitude, Saint Anthony moved farther away from the village, into a graveyard. He asked a friend to bring him a little bread on designated days, then shut himself in a tomb. Then the devils pounced upon the saint intending to kill him, and inflicted terrible wounds upon him. By the providence of the Lord, Anthony’s friend arrived the next day to bring him his food. Seeing him lying on the ground as if dead, he took him back to the village. They thought the saint was dead and prepared for his burial. At midnight, Saint Anthony regained consciousness and told his friend to carry him back to the tombs. The Lord replied, “I was here, Anthony, but wanted to see your struggle. Now, since you have not yielded, I shall always help you and make your name known throughout all the world.” After this vision Saint Anthony was healed of his wounds and felt stronger than before. He was then thirty-five years of age. Having gained spiritual experience in his struggle with the devil, Saint Anthony considered going into the Thebaid desert to serve the Lord. He asked the Elder (to whom he had turned for guidance at the beginning of his monastic journey) to go into the desert with him. The Elder, while blessing him in the then as yet unheard of exploit of being a hermit, decided not to accompany him because of his age. Saint Anthony went into the desert alone. The devil tried to hinder him, by placing a large silver disc in his path, then gold, but the saint ignored it and passed by. He found an abandoned fort on the other side of the river and settled there, barricading the entrance with stones. His faithful friend brought him bread twice a year, and there was water inside the fort. Saint Anthony spent twenty years in complete isolation and constant struggle with the demons, and he finally achieved perfect calm. The saint’s friends removed the stones from the entrance , and they went to Saint Anthony and besought him to take them under his guidance. Soon Saint Anthony’s cell was surrounded by several monasteries, and the saint acted as a father and guide to their inhabitants, giving spiritual instruction to all who came into the desert seeking salvation. He increased the zeal of those who were already monks, and inspired others with a love for the ascetical life. He told them to strive to please the Lord, and not to become faint-hearted in their labors. He also urged them not to fear demonic assaults, but to repel the Enemy by the power of the Life-Creating Cross of the Lord. In the year 311 there was a fierce persecution against Christians, in the reign of the emperor Maximian. Wishing to suffer with the holy martyrs, Saint Anthony left the desert and went to Alexandria. He openly ministered to those in prison, he was present at the trial and interrogations of the confessors, and accompanying the martyrs to the place of execution. It pleased the Lord to preserve him, however, for the benefit of Christians. Another time Saint Anthony left the desert and arrived in Alexandria to defend the Orthodox Faith against the Manichaean and Arian heresies. Knowing that the name of Saint Anthony was venerated by all the Church, the Arians said that he adhered to their heretical teaching. But Saint Anthony publicly denounced Arianism in front of everyone and in the presence of the bishop. During his brief stay at Alexandria, he converted a great multitude of pagans to Christ. People from all walks of life loved the saint and sought his advice. 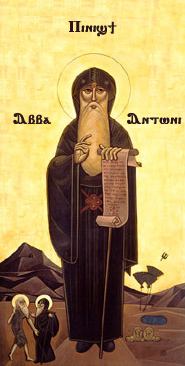 Pagan philosophers once came to Abba Anthony intending to mock him for his lack of education, but by his words he reduced them to silence. Emperor Constantine the Great (May 21) and his sons wrote to Saint Anthony and asked him for a reply. He praised the emperor for his belief in Christ, and advised him to remember the future judgment, and to know that Christ is the true King. The saint instructed two of his disciples, who had attended him in the final fifteen years of his life, to bury him in the desert and not in Alexandria. He left one of his monastic mantles to Saint Athanasius of Alexandria (January 18), and the other to Saint Serapion of Thmuis (March 21). Saint Anthony died peacefully in the year 356, at age 105, and he was buried in the desert by his disciples. The Life of the famed ascetic Saint Anthony the Great was written by Saint Athanasius of Alexandria. This is the first biography of a saint who was not a martyr, and is considered to be one of the finest of Saint Athanasius’ writings. Saint John Chrysostom recommends that this Life be read by every Christian. Twenty Sermons on the virtues, primarily monastic (probably spurious). Seven Letters to various Egyptian monasteries concerning moral perfection, and the monastic life as a spiritual struggle. A Rule for monastics (not regarded as an authentic work of Saint Anthony). In the year 544 the relics of Saint Anthony the Great were transferred to Alexandria, and after the conquest of Egypt by the Saracens in the seventh century, they were transferred to Constantinople. The holy relics were transferred from Constantinople in the tenth-eleventh centuries to a diocese outside Vienna. In the fifteenth century they were brought to Arles (in France), to the church of Saint Julian. bishop to the brethren in foreign parts.